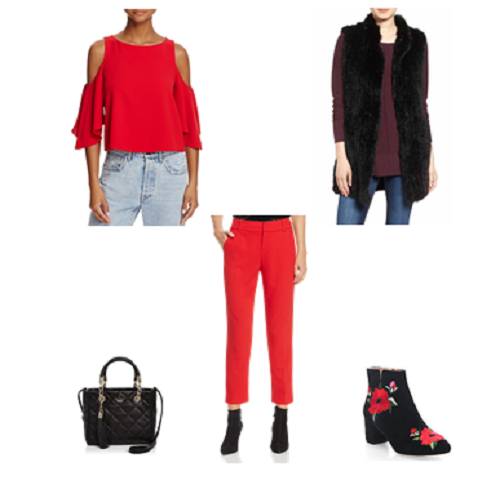 As we continually eek closer and closer to fall, I thought the timing could be right for a short series on fall trends. Let’s kick it off with the color red! It’s easy to incorporate with the summer clothes we’re still wearing and the trend will come on even stronger as we work our way towards fall. 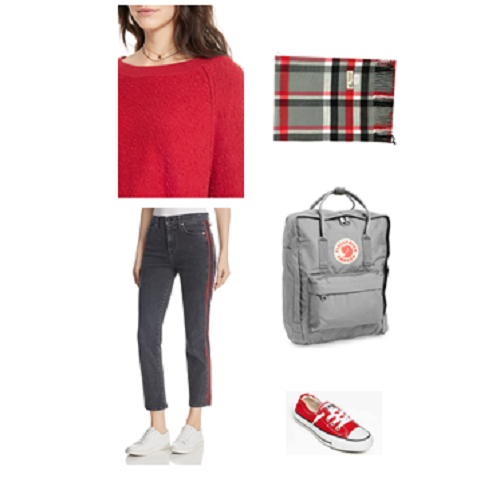 Maybe red just isn’t your color or maybe you just prefer a subtler approach to trends. If that’s the case, keep you outfit simple and just add a small accessory or two in this bold hue! For a more moderate incorporation of the trend, try pairing one main clothing piece (top, bottom or outerwear piece) with one or two accessories (shoes, scarves, handbags, jewelry). 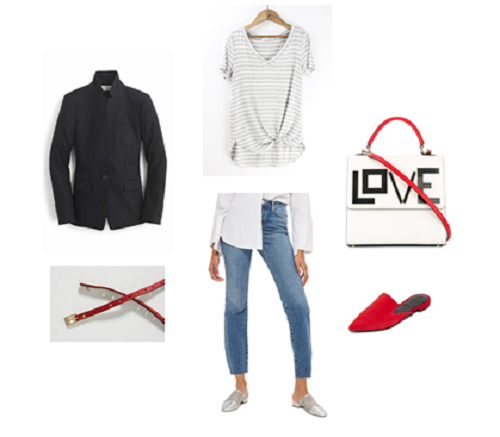 Note how the side stripe on this neutral jean helps carry the color scheme through the whole outfit. Is go big or go home your motto? Then don something in head to toe red: a dress, a jumpsuit or separates (as shown here). I prefer to keep tones matched – they give you a longer line by keeping the eye moving in one solid column. The fur vest and predominantly black accessories keep the look grounded. 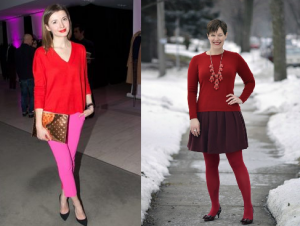 If you’d like to try an even trendier look, aim for two shades of red. Ideally there should be a noticeable amount of contrast or the look will just appear mismatched. Think pink with red or burgundy with red as shown in the examples below found on Pinterest. Thank you, glad you liked! Thanks for stopping by! I do love a bold red outfit! Thanks for sharing these fun tips and combinations! You look fabulous in red, Shelbee! Will look forward to seeing your “red” post if you decide to do one! Agree with you 100% on the clothes and wine comment! Thanks for stopping by!